You should definitely take some time to explore Wild Maths, a site dedicated to the creative aspects of mathematics. Wild Maths is produced by the Millennium Mathematics Project, which also makes NRICH and Plus. One fun things you’ll find on Wild Maths is a game called Square It! You can play it with a friend or against the computer. The goal is to color dots on a square grid so that you are the first to make a square in your color. It is quite challenging! To the left you’ll find my first victory against the computer after losing the first several matches. Now, I am as big of a fan of squircles as anyone, but this video really threw me for a loop. The illusion just gets crazier and crazier! The illusion was designed by Kokichi Sugihara of Meiji University in Japan. It recently won second place in the Best Illusion of the Year Contest. We are fortunate that Dave Richeson has hit it out of the park again, this time sharing both an explanation of the mathematics behind the illusion and a paper template you can use to make your own ambiguous cylinder! Finally this week, I’d like to share a fascinating document with you. It is a supplement to a book called Pioneering Women in American Mathematics: The Pre-1940s PhD’s by Judy Green and Jeanne LaDuke. The supplement gives biographies of all 228 American women who earned their PhD’s in mathematics during the first four decades of the 20th century. You might enjoy checking out this page from the National Museum of American History, which describes some about the origin of the book project. Judy Green, Jeanne LaDuke, and fifteen women who received their PhD’s in math before 1940. I hope you will find both pleasure and inspiration in reading the stories of these pioneers in American mathematics. I have found them to be a lot of fun to read. Recently I’ve been running across tons of neat, slick math applets. I feel like they all go together. What do they have in common? Maybe you’ll be able to tell me. First up, you can tinker with some planetary gears. Then try out these chorded polygons. And then how about some threaded lines? Ready for some more? Because with these sorts of visualizations, Dan Anderson has been on fire lately. Dan is a high school math teacher in New York state. He and his students had fifteen minutes of fame last year when they investigated whether or not Double Stuf Oreos really have double the stuf. Here is Dan’s page on OpenProcessing. (Processing is the computer language in which Dan programs his applets.) And check out the images and gifs on Dan’s Tumblr. Here’s a sampling! Dan also coordinates Daily Desmos, which we’ve feature previously. Check out the latest periodic and “obfuscation” challenges! That’s a chunk of math to chew on already, but we’re just getting started! Next up, check out the space-filling artwork of John Shier. John’s artwork places onto the canvas shapes of smaller and smaller sizes. Notice that the circles below fill in gaps, but they don’t touch each other, they way circles do in an Apollonian gasket. You can learn more about John’s space-filling shapes on this page and find further details in this paper. Thanks for making us this sweet banner, John! Last up this week, head to this site to watch an awesome trailer of a film about Julia Robinson. The short clip focuses on Julia’s work on Hilbert’s tenth problem. It includes interviews with a number of people who knew Julia, including her sister Constance Reid. Constance wrote extensively about mathematics and mathematicians. I’ve read her biography of Hilbert and can highly recommend it. You can read more about Julia and Constance here and here. Julia and Constance as young girls. You might enjoy visiting the site of the Julia Robinson Mathematics Festival. Check to see if a festival will be hosted in your area sometime soon, or find out how you can run one yourself! With May wrapped up and June getting started, I hope you have a lot of math to look forward to this summer. Bon appetit! This Saturday, Steve will be presenting at the first-ever National Math Festival. The free and fun main event is at the Smithsonian in Washington, DC, and there are related math events all around the country this weekend. Check and see if there’s one near you! Here are a few pieces of math that Steve liked recently. I liked them as well, and I hope you will, too. It appeared on Numberplay and was created by Hamid Naderi Yeganeh, a student at University of Qom in Iran. Look at the way the smaller and smaller tiles fit together to make the design. It’s sort of like a rep-tile, or this scaly spiral. And do those shapes look familiar? Hamid was inspired by the shapes of the continents of Africa and South America (if you catch my continental drift). Maybe you can create your own Pangaea-inspired tiling. If you think that’s cool, you should definitely check out Numberplay, where there’s a new math puzzle to enjoy each week! Next, up check out the Math Explorers’ Club, a collection of great math activities for people of all ages. The Club is a project of Cornell University’s math department, where Steve teaches. The first item every sold on the auction site eBay. Click through for the story! One of the bits of math that jumped out to me was this page about auctions. There’s so much strategy and scheming that’s involved in auctions! I remember being blown away when I first learned about Vickrey auctions, where the winner pays not what they bid but what the second-highest bidder did! If auctions aren’t your thing, there’s lots more great math to browse at the Math Explorer’s Club—everything from chaos and fractals to error correcting codes. Even Ehrenfeucht-Fraïssé games, which are brand-new to me! And finally this week: have you ever wondered “What will I ever use math for?” Well, SIAM—the Society for Industrial and Applied Mathematics—has just the video for you. 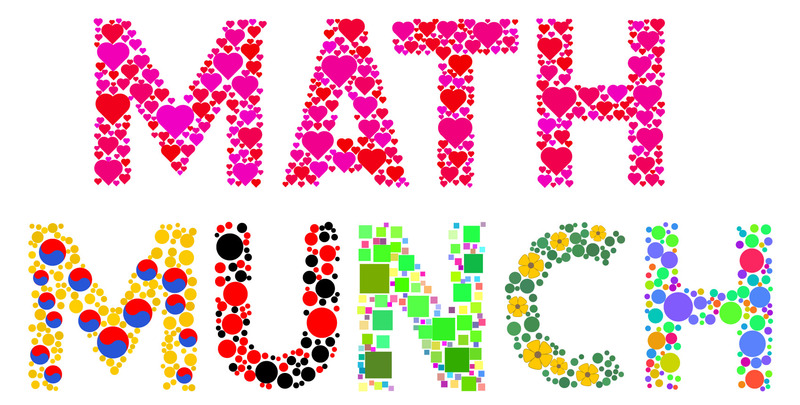 They asked people attending one of their meetings to finish the sentence, “I use math for…”. Here are 32 of their answers in just 60 seconds. Thanks for sharing all this great math, Steve! And bon appetit, everyone!